A gathering to celebrate Martha’s life will be 2 – 5 PM, Saturday, February 9, 2019 at the Woodlawn Church of God, Clinton, IL. Calvert Funeral Home, Clinton, IL assisted the family with cremation rites. Survivors include her husband, Joseph Underwood, Clinton, IL; children, Marty Underwood, Plano, TX; Mindy Underwood, Normal, IL; Marlin Underwood, Clinton, IL; Martina (Raymond) Toohill, Wapella, IL; step-daughter, Pam Allsopp, Normal, IL; grandchildren, Maranda Underwood; Haley Toohill; Ashley Toohill; Elizabeth Williams; Daniel Taylor, II; great grandchildren, Brylee Summers-Toohill; Tomias Underwood. Martha worked with her parents for many years at Neal’s Bakery which was famous for their nut and cinnamon rolls, and also worked at the Clinton High School for 20 years. 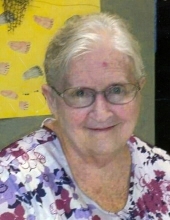 She taught Sunday School at the First Christian Church, Clinton to the 5-year-old children for 25 years. A 25-year member of the Clinton Khory League, Martha started as a coach and rose to President in 1971. Also, she was a member of Tops Weight Group for 25 years. She was a very active member in the school band and athletic club, volunteering at the Apple and Pork Festival for the Band Boosters, and chaperoning for band trips. She also volunteered at the YMCA helping with the Swim Team. "Email Address" would like to share the life celebration of Martha M. Underwood. Click on the "link" to go to share a favorite memory or leave a condolence message for the family.